Wow, just wow! 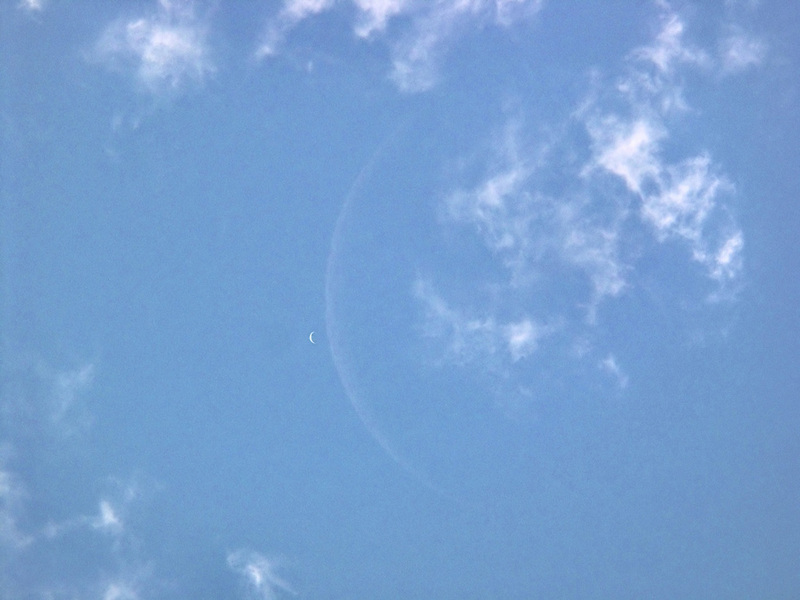 This is an image of the Crescent Moon about to occult the crescent Venus. Go straight to Astronomy Picture of the Day for full details, or visit Edar Ivan's astrophogoraphy site. We're pretty animated here at Astroblog. First it was V838 Mon, then comet M4 Swan, then the Orionids and of course, Jupiter Mercury and the Moon. Now it's sunrise on the Moon. Before I give you the link, look at the images above. 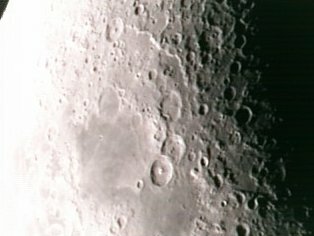 In these shots, taken 3.5 hours apart, you can see the crater shadows shrink and a crater wall light up as the Sun rises on the Moon. I was inspired to do the animation partly by the great animation fest just experienced, and partly because the Virtual Moon Atlas showed the terminator between craters Albategnius and Ptolemaeus. 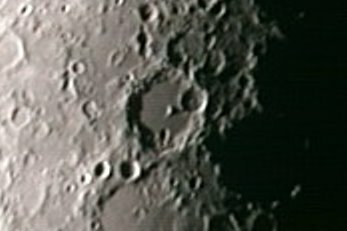 As you can see from the screen shot the terminator appeared to light up the base of Ptolamaeus (and illuminate the central peak of Arzachel (not on this image, but in the animation) at 10:15 pm local time.. So I set up the scope at 7:30 pm local time and took images approximately every 15 minutes. I say approximately, as Smallest one woke up and wandered out. "Stars Daddy" uttered next to my elbow was the first intimation that he was not tucked up in bed, so I spent another half hour cuddling him to sleep. The Oldest One woke up, too excited by his school camp the next day. So I spent another half hour putting him to bed again as well. Without anymore ado, here is the Animation. One one channel, "The Space Race", at the same time "Most of our Universe is Missing". Which to watch? Or shhoul I just image the Moon? The IMO Orionids preliminary data has come out, and they had a ZHR or 40+ for the 21st and 23rd, and 50+ for the 22nd. Predicted ZHR's wre in the region of 20. A fantastic animation of the Orionids as seen from Melbourne, Australia (despite the light pollution) has been producedby Bert Van Donkelaar. Animations of the period 21-22 October and 22-23 October can be seen at the linked Ice In Space forums. (Tip of the hat to Bellatrix). Stunning comet M4 Swan images. Comet M4 SWAN is still in outburst, athough fading. Over at astrostudio you can see this stunning image of the comet taken by Michael Jaeger. There is also an amazing animation from the 16th. Dave P has an account of his observation of the comet. Here are some sketches from Martin Mc Kenna. Carey Johnson has a rather interesting view of the comet. The BAA has a podcast and animated spotters map of the comet. 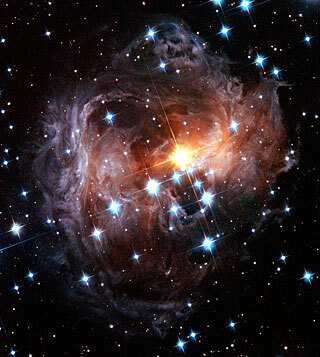 Run, don't walk, to Stuart's Astronomy Blog to see this amazing movie Stuart has made from the Hubble images of the gas shell around V838 Monocerotis. Yet another in my famous series of dark murky shots with tiny dots in them. 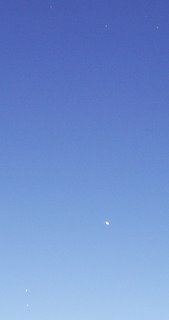 Click on the image to enlarge it and you will see near the top left, the start of a -6 Iridium flare. In our last exciting installment of "dark murky shots with tiny dots in them" our hero had caught the tail end of a -6 flare by aiming the remote the wrong way. This time everything was set up prefectly, except I presssed the button a tad early, and the automatic "6 seconds and no longer" dark exposure cut off just before the flare was at its brightest. I have to invest in a talking clock with second accuracy, I think. Both Tom and the Bad Astronomer have blogged this, but I'm going to as well. Spirit has been parked on a ridge during winter, when the solar intensity has been too low to give it a lot of power. During this time it snapped the above 360 degree panorama (slowly, it took 119 Sols to complete). It's truely stunning. As well, Spirit has passed its 1000th Sol (Martian Day), not bad for something designed to last only 90 Sols. As Martian Spring approaches, Spirit will be gearing up to do more science. Next week it will drive to some rocks that may be the result of a volcanic eruption. For high resolution images and the original press release, see here. For a stunning 3D anaglyph picture, where the rocks jump out at you, see here (you neeed coulour 3D glasses though). A good New Scientist article is here. Mercury and Jupiter (bright dots near the horizon) gleam in the twilight, while above the crescent Moon glows under Antares (click to enlarge). 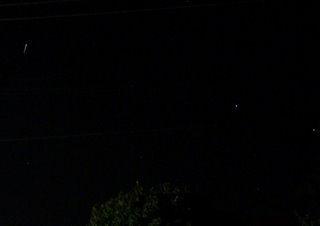 Despite missing the Moon, Mercury Jupiter lineup, I got to see this wonderful display. I even made an animation of it (WARNING 3.6 Mb gif file). I've finished my Mercury/Jupiter conjunction campaign now. I've got a bit over a weeks images to collate and overlay, maybe I'll make an animation of them too. Comet M4 Swan in Outburst. Comet M4 Swan is in outburst, and is currently magniude 4.5, visible to the unaided eye. See spaceweather.com for spotters maps and details. Unfortunately, it is visible only in the northern hemisphere. See here, here and here for recent images. This is also a great video here. Over at the Planetary Society Weblog, Emily Lakdawalla reports that Messenger survived its encounter with Venus. Not that you would know this from the Messenger site, the news there hasn't been updated since September. Memo to Messenger outreach people, plucky little spacecraft on long voyage does dangerous manouver far from Earth, thats news folks. Today the Solar obesrving satellites STEREO will be launched, and the gamma ray telescope GLAST launches in October 2007. Tonight the clouds squatted on the horizon like malignant toads, preventing me seeing the lineup of the Moon, Mercury and Jupiter. So I'm posting an image from last night of an Iridium flare that almost got away (naturally tonight's was clouded out too). Click the image to enlarge it. The flare is the bright trail off to the left, the two bright stars are alpha and beta Crucis. After the successful capture of the ISS passes, I resolved to capture an Iridium flare with my digital camera. Because the flares are so short in duration, you need careful timing to catch them when your exposure time is fixed at 6 seconds. 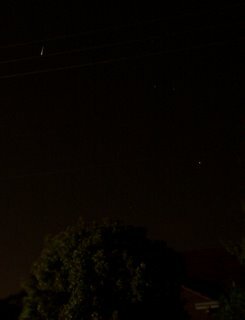 From Adelaide we have been treated to a series of bright Iridium flares happening almost due South, but only around 18 degrees above the horizon. On Saturday I missed the flare completely, on Sunday I was still setting up my camera when the flare appeared. So on Monday, I had got out early to set up and was waiting confidently as the flare began. I pushed the remote ... and nothing happened. Several increasingly panicked pushes later I noticed that the IR beam was facing AWAY from the camera. A quick reverse and I was able to capture the tail end of the flare (fading from -6). Better luck next time. The Messenger probe, en route to Mercury, was supposed to flyby Venus today. However, there is absolutely no news of the encounter on the Messenger home page. Over at the Planetary society Weblog, it would appear not much will come from this encounter with Venus. As Venus is nearly at opposition, the probe will be out of contact with Earth as it zooms past, making it hard to do any science. So it is unlikely we will have any breathtaking images. For those of you left brereft by this, the JPL Solar System Simulator has added Messenger to its list of spacecraft, so you can see Venus from the point of view of Messenger as it goes by. Some interesting reports to keep the life on Mars controversy bubbling. Experiments with bacteria from extreme environments show that they can survive under the conditions of current Mars soil. As well, experiments have shown that the Viking Lander Mass Spectrometer, which was supposed to pick up evidence of organic matter on Mars, was too insensitive. It was unable to detect the organics in soil from Antarctic dry valleys, where there are indeed living, respiring bacteria. So there still remains the possibility that Martian bacteria are hiding in the soils there (I won't get excited until Martian bacteria are actually cultured, myself). As well, check out this great virtual reality flyby of the Face on Mars, courtesy of the ESA (hat tip to the Bad Astronomer). Does Blogger support IFRAME? I am completely dedicated to SkyMap Pro as my astronomy charting software, but it does cost the odd bob or two. Cartes du Ceil is a free program which work rather nicely (after you sort out what downloads where). However, if you have a JAVA enabled web browser, try out SkyView Cafe. It's a little slow over dialup lines, and not as full featured as a commercial application, but it is free, configurable and works quite nicely indeed. Drop into the SkyView Cafe homepage for more information. The Blogger server went belly up last night, it's working now, but the RSS feed is munged. I've tried reloading it, but to no avail. Hopefully this will resolve itself soon, but at the moment there is no working RSS feed for this blog (grrr). UPDATE: Unfair to blogger! Copying and pasting from MS word caused some of Words loopy HTML nonsense to be incorportaed, which mucked up the XML code. Hand cut out the characters and all was fine. I see lots of interesting things about astronomy and Science that I would love to blog, but time just gets away. Here's a list of things that I found interesting in Astronomy news and Blogs. 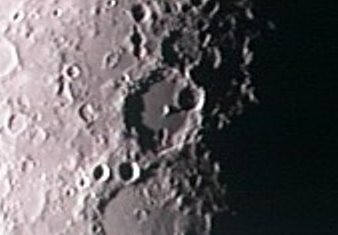 The hottest story was the reports that there may be no ice in the deep craters on the Moon. Lunar landers and space elevators. Check out this Astronomy Picture of the Day of the Orionids. Comet T1 levy is a recently discovered periodic comet (5.22 years) that may have some interesting meteor showers associated with it. 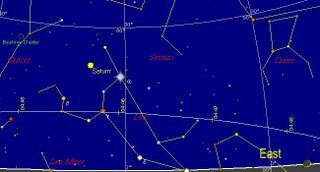 There is a possibility that there will be an outburst (althought not strong) in the constellation Cephus on the last day of 2006 (31-12-06) and possibly one in 2009. More will be certain when the orbit is refined with further observations. The Leonids this year may be interesting, one prediction is for possibly a ZHR of 100 or more around November 19, 4h45m. A more pessimistic prediction is for a ZHR of 35 around November 19, 4h55m UT. Still with the moon almost new, it will be worth watching. 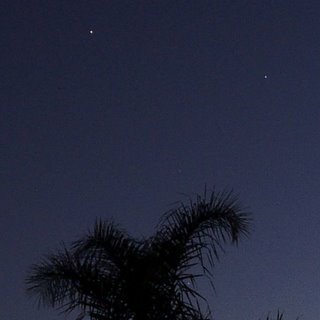 Saturn and Regulus (alpha Leonis) shine in the morning sky, as the ISS emerges from behind a palm tree (click to enlarge). I had planned to get up on Sunday so I could do a 2 am to 4 am watch. In the end I dragged myself out of bed after 2.30 am, and by the time I got my gear assembled, I only started looking seriously between 3.00 am-4.00 am. 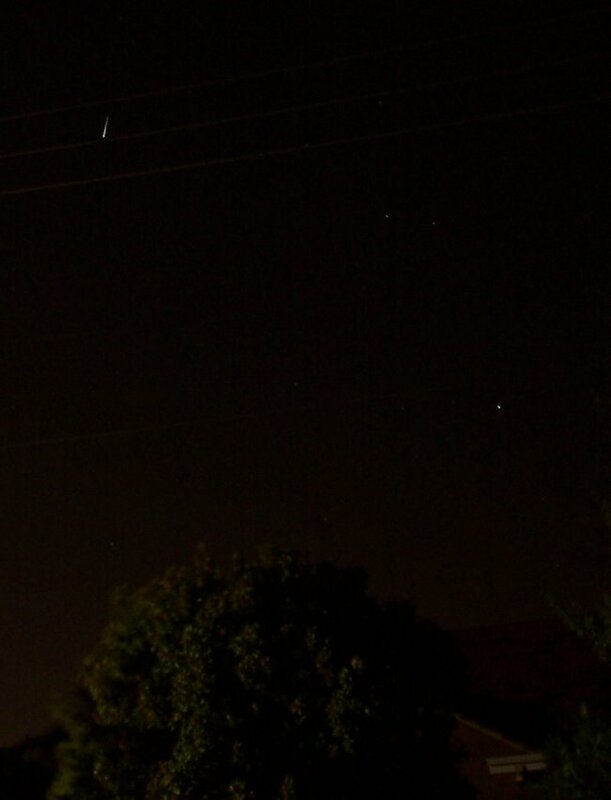 But what a session it was, I saw 21 Leonids in an hour. With a limiting magnitude of 5.5, and the radiant never getting more than 38 degrees above the horizon, that means the ZHR was substantially more than the 23 predicted. Indeed reports coming in from around the world suggest that the Orionids were in outburst, with at least a ZHR of 30. But I saw some beauties, I saw two bright meteors shooy between the Hyades and Pleaides (of course my camera wasn't pointing that way). I saw a brilliant -6 fireball shoot straight down to the North), I saw some brilliant long trained meteors and as I ended the session, two Orioids shot out together. This was an excellent session. Unlike Saturday, when the trains were relative short and the meteors didn't go far from the radiant, these ones covered large chunks of the sky. I had the film camera covering the triangle between Orion, Sirius and Procyon, where most of the meteor action was on Saturday, but on SUnday the fireworks started outside that area (sigh). As well, I picked up 5 sporadics (one rather bright) and three satellites. A very busy and rather beautiful morning. 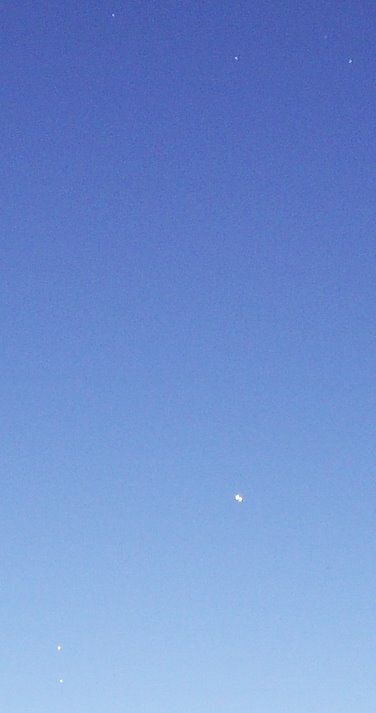 Even wehn I was packing up the camra, a beautfiul meteor zoomed by, not a bad moring at all. Over at the Ice-in Space Orionid forum it looks like other Asutralians have been having good sessions as well (scroll down to the bottom). My Orionid session didn't start too well, the whole northern sky was covered in cloud when I got up. It cleared by 4 am, with Orion sparkiling in the predawn dark I was immediately rewarded by a long, bright Orionid. I got a view of the -5 Iridium flare as well. In the next 15 minutes I saw 5 Orionids , mostly bright but short, one very bright sporadic and a satellite. The following 15 minutes saw the sky beining to lighten, and I saw only two Orionids, one bright one dim. By 4:30 the sky was well and truly lightening, but I still saw one long Orionid accompanied by birds greeting the dawn. Then I watched the ISS skim under Saturn, and packed up. Tommorow morning I plan to get started around 2, and maybe get the film camera out for a long exposure. On the morning of November 9, New Zealand, Australia and East Asia will see Mercury pass in front of the Sun. I've created a webpage with details of when to look, and what to look with. Pop in, have a read, and get ready for the last transit of Mercury visible form Australia until 2032. The north-eastern horizon looking north east at 4:46 am from Adelaide on Saturday 21 October (click to enlarge). As I wrote before, there are several other things to entertain us as we watch for Orioinids in the early hours of the morning on Saturday and Sunday. 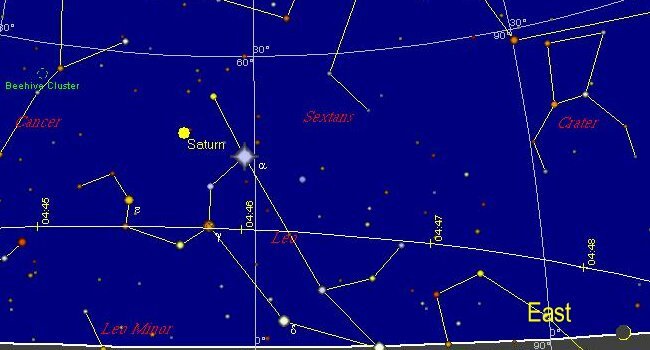 In Adelaide, there is a -5 irridium flare in the north-west at 3:56 am on Saturday, then the ISS passes below Saturn at 4:46 am. Most of South Australia and the Southern Northern Territory sees this. 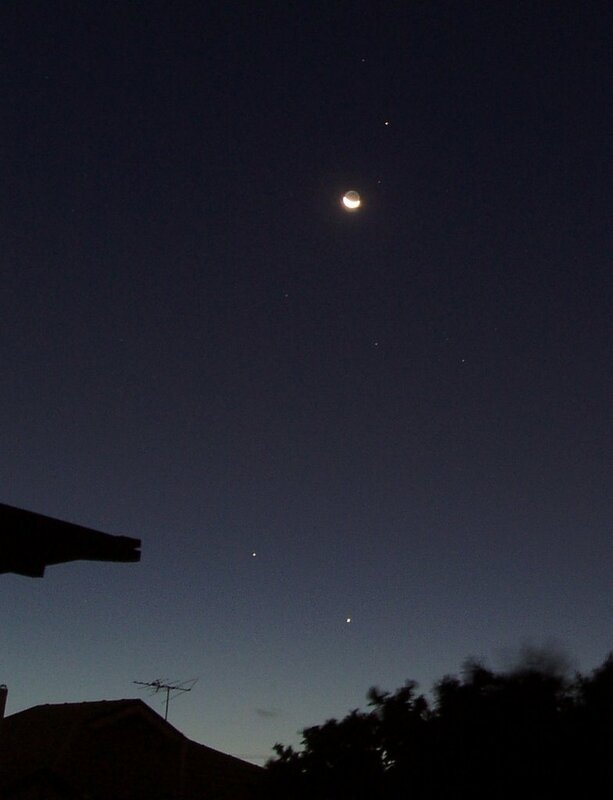 In Alice Springs the ISS passes between Saturn and Regulus at 4:43 am. In Brisbane there is a -1 Iridium flare on Saturday at 3:33 am in the northwest, and the ISS passes above Saturn on Sunday about 4:03 am. Most of the rest of the East Coast and Darwin is dissapointing in terms of the ISS or Iridiums, but check Heavens Above closer to the date for updated information for your site. As well, there is a coronal hole on the Sun pointing our way. 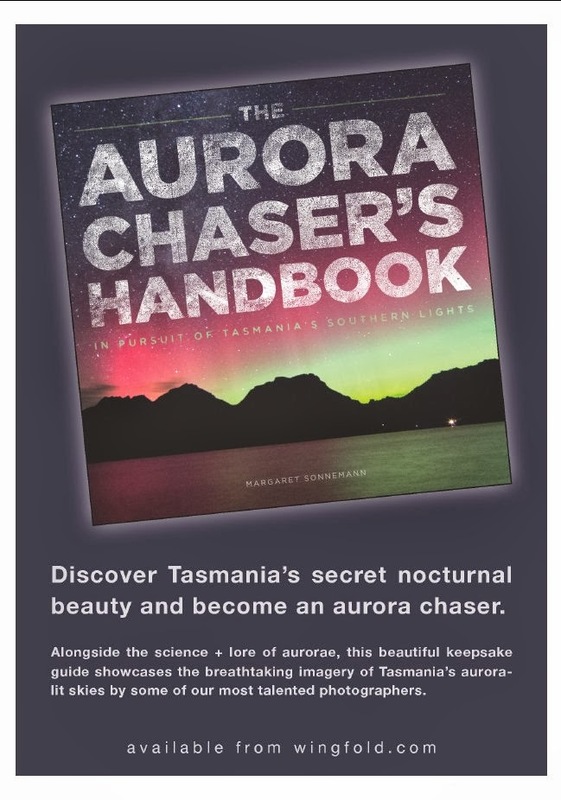 A stream of charged particles is expected to hit sometime around the 21st, so when out looking for Orionids on Saturday and Sunday, keep an eye out to the south for possible aurora in you are in Tasmania or Southern Victoria. Also, don't forget to check out the SOHO Lasco C3 camera on the 22nd for the lineup of Mars, Venus and the Moon. The difference bitwene pyracie and academicks ys so smalle that eyther opcioun shalle haue for yow the same resultes. Yn both cases, ye werke yn cramped condiciouns, and vndir tyme constrayntes, and do face manye folke who wolde fayne nat haue yow ther, and yet ye haue felaweshipe, and a grete deale of strong drinke, and eek a specialisede vocabularie the whiche othir peple vndirstonden nat. Al thogh fewe academicks weare eye-patches. As an academic, that tickles my fancy. I should start wearing eyepstchs to committe meetings. 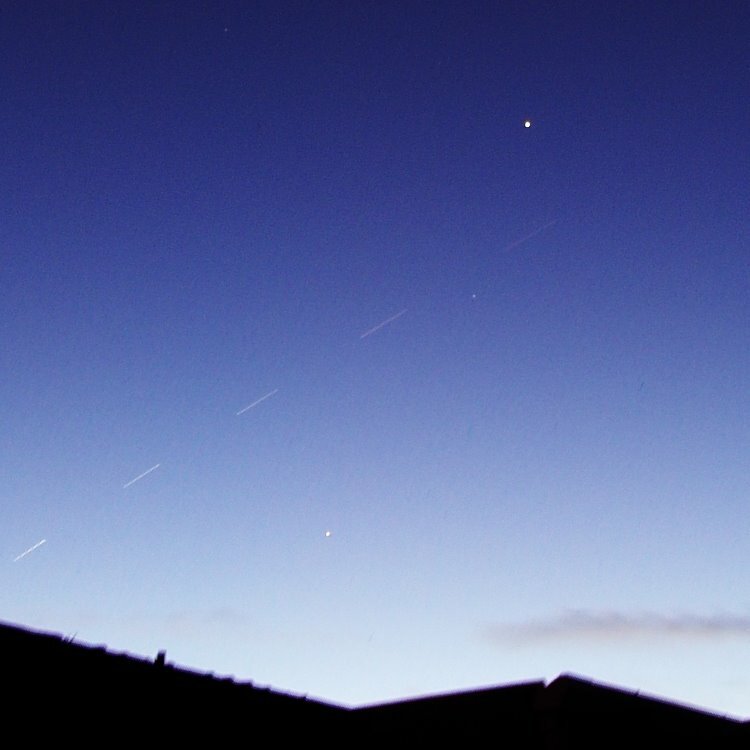 The morning sky as seen in the Southern Hemisphere, facing northeast at 2.00 am. 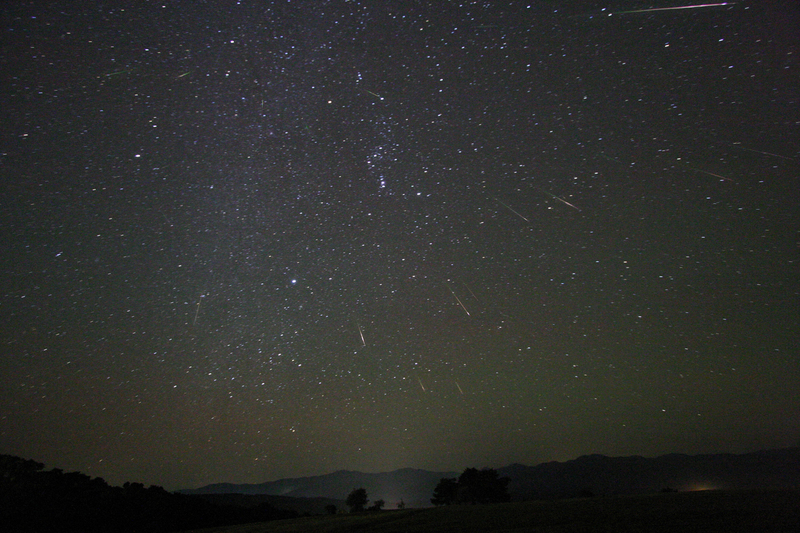 The Orionids are a fairly reliable meteor shower that somewhat favours the Southern Hemisphere. This year the moon is new during the maximum, so we have a good chance to see some decent Orionids for the first time in ages. The Orionids peak in the early UT morning of the 21st, for Australians, this means the peak is in the middle of the day on 21st, and the best time to observe is early morning on Sunday the 22nd. However as the Orionid peak is broad, watching on the early morning of Saturday 21 will work too. The radiant, the point where meteors appear to originate from, is just below Betelgeuse, alpha Orionis, below the distinctive saucepan shape of Orions Belt. Although Orion rises before midnight, you will need to wait until around 2 am before the radiant is high enough to see significant meteor action. The ZHR for this years Orionids is 23, but for most of the night you could expect to see around one meteor every 5 minutes. The Orionids aren't particularly bright (which is a pain in the inner suburbs), but every so often you should see a nice one. When watching, rug up well (it will get cold), and get yourself a comfy chair or banana lounge and scan the sky around the radiant. Although the meteors seem to originate there, when traced back, you will usually pick them up some distance away, so sweep around the area to pick up meteors. Give yourself a little while for your eyes to accommodate, the first five minutes or so in the dark will be wasted as your eyes dark adapt. While watching for Orionids, keep an eye out for Satellites, if you are watching in the Central states, from about Alice Springs down, on the 21st at around 4:44 am the ISS passes under Saturn. Should be nice. 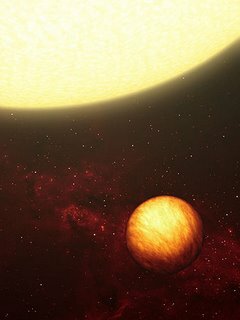 Of the 210 exoplanets discovered so far, around 10% of them scream around their Suns in tight orbits, much closer than Mercury is to our Sun. 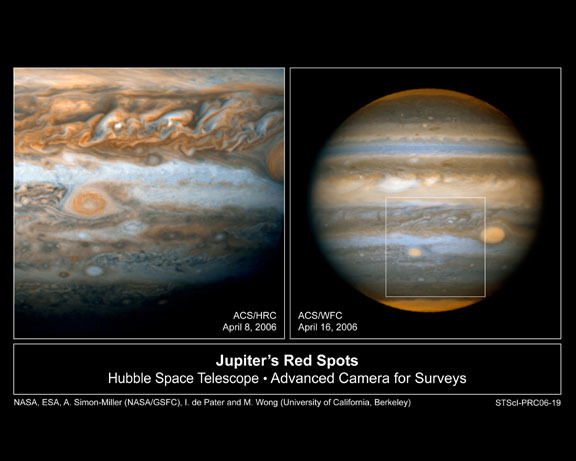 This has earned them the nickname "hot Jupiters" (as they are almost all Jupiter sized or above)*. 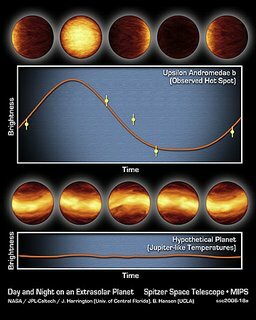 Upsilon Andromedae b , is such a world. At 69% the mass of Jupiter, it s year is just under five days long. Although this world must be tidally locked to its Sun (hence always having the same side face the Sun), massive jet streams in its super-heated atmosphere would redistribute the heat, making the planet an even temperature. However, the latest data from the Spitzer Infra-Red telescope suggest that this is not the case. Spitzer looked for fluctuations in the infrared intensity of Upsilon Andromedae and found that it fluctuated with the orbital period of Upsilon Andromedae. If the night and day side of this planet were similar, then they would have seen no fluctuations, but as they did, this suggests that the night and day sides of the planet are very different temperatures (See this page for cool videos of the orbit). The day and night sides of the planet differ by about 1,400 degrees Celsius. This means that the hot atmosphere from the bright side must dramatically cool as it circulates. Quite how this happens is not clear. Back in the 90's the idea that we could every detect planets around other world seemed incredible. Now we can measure the contents of their atmospheres and watch their night and day progress. That's amazing. Comet M4 Swan is still giving the northern hemispherians some good views (scroll to the bottom of the Cometography page for some new images). The lead picture on Cometography even turned up on Astronomy Picture of the Day. Here's another nice image, one showing jets, and a cute animation. 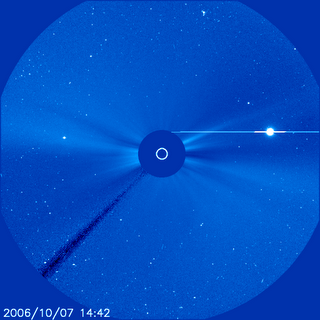 Speaking of comets, drop into the Cometary Archive for Amateur Astronomers, a useful resource site for people interested in comet photometery. Mars, Venus and Spica all near the Sun as seen by the SOHO Lasco C3 camera. Mars will be at its closest on the 23rd, but will probaly disappear behind the occulting disk before then. The line up of Moon, Mars and Venus on the 22nd probably won't work if Mars is behind the occulting disk. Might catch the edge of it in the C2 camera thhough. Anyway, have a look at the recent videos low (198k) and high (1.2 Mb) resolution. The cosmic ray flashes make it a bit difficult to follow, but you can see stars down to magnitude 4.5 at least. 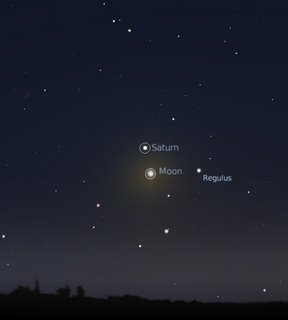 In the early morning on Tuesday 17th, Saturn, the Moon and the bright star Spica from an attractive triangle in the head of Leo the Lion in the north east. Best seen between 4 and 5 am. Mercury Rises [the two bright "stars" at the bottom] as Jupiter sinks under the head of the Scorpion (click to enlarge). Over the coming week Jupiter and Mercury come together, being at their closest on the Friday 20th. This should be a very attractive sight (it looks pretty good at the moment), with both Mercury and Jupiter being very distinctive. Then on the following Tuesday, (24th) the Moon, Mercury and Jupiter line up. I am tryig to make an animation of this, the problems being that a) I have to try and go out and snap pcitures during dinner, not cool and b) I was trying yo use a fixed arcitectural feature as a reference, so I could get star movement as well as planet movement. However, even though I have a point to set my camera up, eeven minor devation from night to night make it impossible to align correctly (GRRRR). Oh, well. I'll try centring it on alpha Librae or something. Still should look nice. There is, I promise. 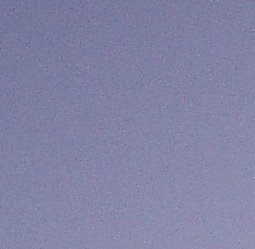 There were two good Iridium flares this "evening", a -5 and a -2, both occuring withing 4 minutes of each other, and nearly side by side in location. Unfortunately, they occured 10 and 14 minutes after Sunset respectively, well before the end of civil twilight. But I set the camera up anyway, and in between SkyMap and Heavens Above, I was able to see the flares burst from the blue. It was pretty amazing, the flare was of course much more fleeting than those I have seen when properly dark, but they were very clear. Sadly, the brightness of the sky was a bit overwhelming for my poor camera, which recorded only clear skies. My next task is to see a daytime flare. Remember RedSpot Jr? The mini red spot (about the size of Earth) that formed from the merger of three smaller storms has not only survived its passing of the Great Red Spot, but is now as red as the GRS itself, and its winds have grown stronger. They now reach 400 miles per hour. This suggests the storm is growing stronger and Red Spot Jr. will be around for some time. The Hubble press release with more details is here. At work of Friday I recieved a letter from Arthur C. Clarke. It was a mass mailout letter to be sure, getting me to do a survey for, and perhaps join, the Planetary Society. But even so, I was mildly chuffed that I had been chosen to be part of this mailout, but how was I chosen? Did they complie a list of all astrobloggers? Or people who contribute to Astronomy magazines? But Puxzzlement arose, I don't list my Uni address in any of my astronomy work, so how did they find me? Then my PhD student popped his head around the door "Hey, do you know anything about the Planetary Society?" Yes, it looks like they got university staff lists from somewhere, and mailed it to everyone at every university. So much for being special. Your copies of Sky&Space are here (a delay due to production problems). 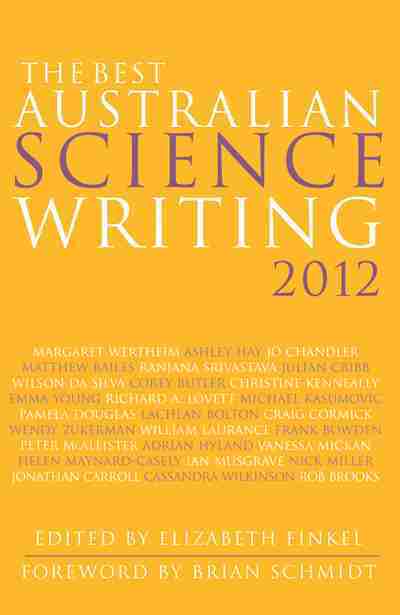 Go here and send me an email with an appropriate contact address* and your copy of Sky& Space will be on its way. John, I'll bring a copy up with me in September. Some very nice posts, if you haven't seen them. Stuart on the critical density of the Universe (apparently the universe would float on water), some nice images of M15 from Tom, the return of Dirty Skies, and nice Lunar Image during the Pleides occultation from Top o' the Lawn, and lastly, a great article from the Bad Astronomer on the alignment of the dust disk around epsilon Eriadani (beloved of science fiction writers) and its planet. No, not lastly, you also have Respectful Insolence on people who sue over alien abductions. Saturn as you have never seen it. 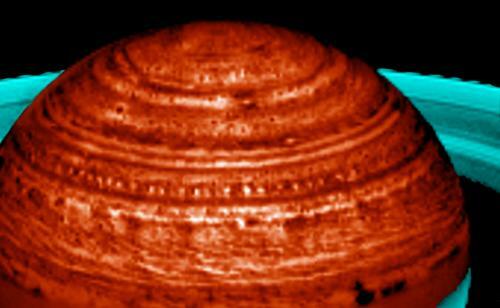 This stunning image is from Cassini's visual and infrared mapping spectrometer. The bright patches are actually cloud clearings, glowing with heat from deep within Saturn. There are a number of interesting features, such as the dark "donuts", but the outstanding feature is the "String of Pearls". The regular line of alternating dark and light features. This line of clearings stretches over 60,000 kilometers, which is pretty amazing. Exactly how this regular feature is produced is not certain, but it is long lasting, having beeen around for several months. See the NASA site for more details and a higher resolution image, or this New Scientist news article. Not boggled enough? Head over to the Bad Astronomer NOW for the Best.Saturn.Picture.EVAH! 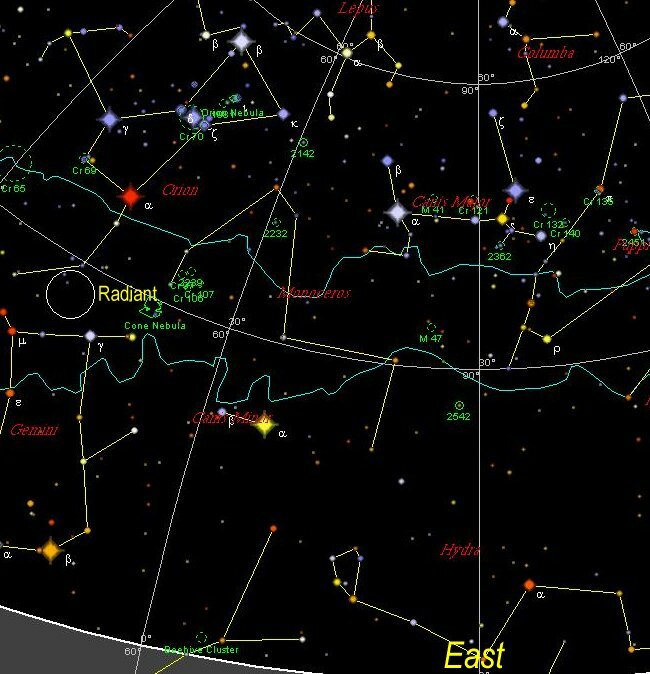 This is a nice binocular comet at the moment ... for the northern hemisphere. So us Southerners can enjoy these images from R Vandenberg and M Mobberley. These are some images I took back in August, and never got around to posting. This is my favorite goup of craters. One day I'm going to image them when the Sun is just right. 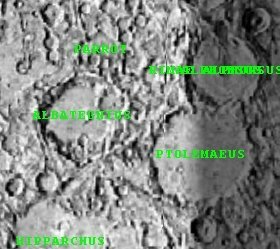 The craters are (in ascnding order) Theophylis (the equivalent of cafffine in tea is Theophyline BTW), Cyrillus and Catharina. One of my better moon mosaics (alt least in terms of clarity and overlap), click on the image to enlarge it. The seeing was almost pefect when imaging this night. 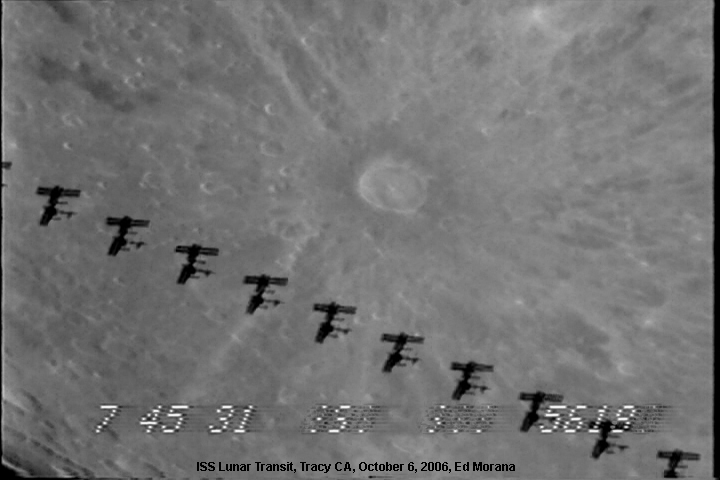 While on the subject of the ISS, pop over to Ed Morana's ISS transit page to see a truly amazing ISS transit of the Moon. The main page has a variety of animations as well, like this MPG. ISS, Mercury and Jupiter, double wow! I was idly checking if there were any current ISS passes in my area, when I found that the ISS was about to pass between Jupiter and Mercury in two minutes time! So I grabbed my camera and tripod, rushed outside and feverishly set up the camera. Just as I was ready, the ISS appeared, and I got off these shots. The ISS was a lot brighter than it appears in the image, due to the method I used for overlaying the images. This animation is much better at conveying what it is like (warning 3 Mb). After taking my shots I watched the station pass delta and alpha Ophici and on through Cygnus. A truly amazing encounter on a moments notice. Where's Mars and Venus Now? Right now, Mars and Venus are too close to the Sun to observe. 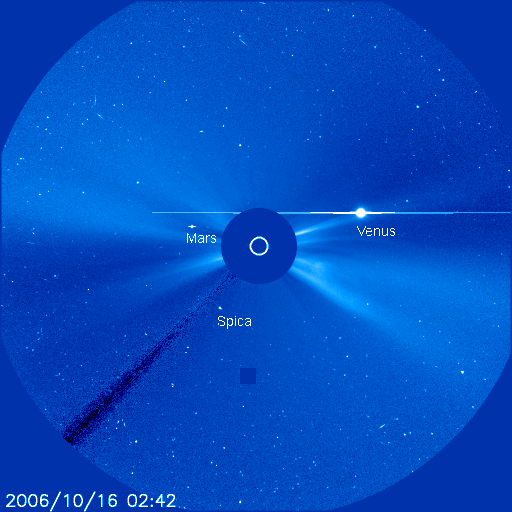 In this LASCO C3 image, with the Sun occulted out, Venus is the bright object on the right with the spike artefact running through it, and Mars is the brightish dot in almost the same position directly opposite. This animation (220k) gives you a good idea of how they are moving, and here is a larger animation (1.4 Mb). Very interesting encounters happen in a couple of weeks time that can only bee seen via the SOHO C3 camera. On October 22, Mars, Venus, the Sun, the Moon and the bright Star Spica are all in a circle 5 degrees across (see image below). 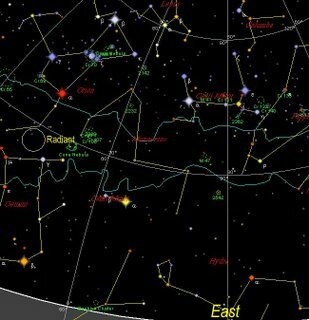 On the 23rd Mars is in conjunction, and on the 26th Mars and Venus are at their closest. 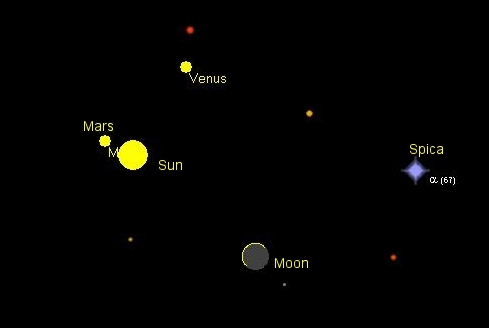 Alignment of Mars, Venus, Moon Spica and the Sun on the 22nd (generated in Skymap). 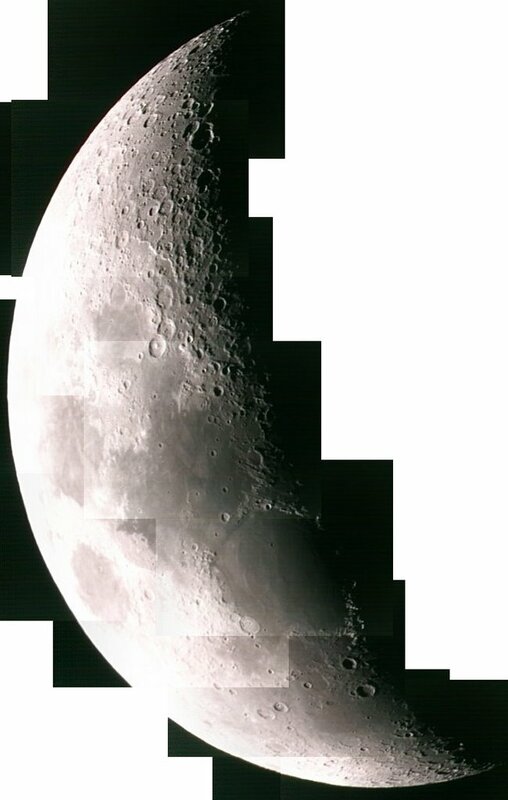 I am not sure how the Moon will look in the C3 camera though. On the 19th, Mars Spica, Venus and the Moon all lie withing a circle 3.5 degrees in diameter. The October issue of Southern Skywatch is now up. Sorry its late folks, but while on Secret Family Business I was 10 days without computer or internet connection, and then I had to catch up with lots of work stuff. Anyway, this month Mercury and Jupiter meet up, the Orionids may give us a nice meteor sjhower, and the Moon makes some intetesting patterns with Mercury and Saturn. I.m off to pick up the Bettdeckererschnappender Wiesle and the boys from the airport now, catch you later.